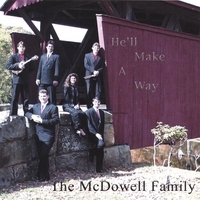 A collection of high energy Country Gospel music with awesome family harmony from a talented and dedicated family. This album is sure to bless and encourage. It all started as far back as 1949 when Porter McDowell became a member of the legendary “Indiana Redbirds”. While with the Redbirds a song was written by them, called “Cowboy Auctioneer”. This song went to the top ten on the 1951 Country Western charts and put Porter McDowell along with the Redbirds on the map in Nashville, Tennessee. His name was in the files at the “old” Country Music Hall of Fame Museum”. He continued to work steady during the pioneer days of live country radio programs in several area bands. The first national country music radio show, WLS, out of Chicago, Illinois, aired their WLS Barn Dance which Porter played many times. In 1957 he joined up with The “Midwestern Trio” and continued his radio work along with local television footage of their music. During that career he had the opportunity to work alongside such names as Tex Ritter, Roy Rogers, Roy Acuff, Little Jimmy Dickens, and Carl Smith to name a few, who would appear at the Buck Lake Ranch in Indiana, know as the" Nashville of the North". Porter's son David McDowell, born June 11.1952, was surrounded by the musical influence of his father as he grew up. In his early twenties, he met the well established Nashville songwriter, Billy Nix. Billy had a group called Billy Nix and the Ideals. David became an Ideal playing bass for Billy until mid 1979. This opened up many opportunities to learn the business as he worked in concert, club, and studio environments. It was during the mid 70's when David met and married his present wife, SherryJo Holland. In late 1979 David and his wife started their own country / country rock band called “Sweet Water Junction Band”. This band proved to be a popular, high energy country band in that tri-state area. David played lead guitar and sang bass and shared lead vocals. The Sweet Water Junction Band had a career that included working with many other Country artist, some as well known as; Dave Dudley, Del Reeves, Sonny Wright and Peggy Sue Webb, sister of Loretta Lynn. Dave continued with his group until 1988, when he moved his family from Fort Wayne, Indiana to Rockledge, Florida. My favorite song on this CD is Ain't No Grave!